The Circadian Rhythm is a 24-hour biological wake – sleep cycle that governs most animals and humans in a synchronized series of natural functions and responses. You are set to respond to the circadian rhythm based on an inner biological clock. For example, when it gets dark at night most animals respond with heightened melatonin, a hormone secreted by the pineal gland in the brain. This increase in melatonin sets your natural sleep in motion and you start to get sleepy. The circadian rhythm directly affects other essential drives and behaviors: hunger and thirst, and body temperature to name a few. The actual chemistry of the Circadian Rhythm and the biological clock concept is complex and has only recently been intensely studied. The intake of lightness and darkness through the retina in the eye is a cue for your biological clock—in sleep medicine this cue is called a zeitgebar, a German word. Animals and humans with blindness often suffer Circadian Rhythm disorders because of this sensory loss. And it’s clear in sleep studies that light can disrupt some people while sleeping. Bright street lights, a television left on, even the LED light from a bedside alarm clock can disrupt sleep in some. The key to your inner wake-sleep clock is the small hypothalamus in the brain. Here a variety of neuro-hormones tied to specific functions are managed, as is the group of cells responsible for the circadian process. Simplistically speaking, the light cues taken in through your retina—daylight changing to nighttime and vice versa-- send signals directly to the hypothalamus, stimulating the circadian rhythm receptors. These receptors, in turn, send follow-up signals to the pineal gland, where a dose of sleep-inducing melatonin is released to your body. Near morning your melatonin levels drop once again, to daytime levels, and core body temperature dips in a key circadian pattern. 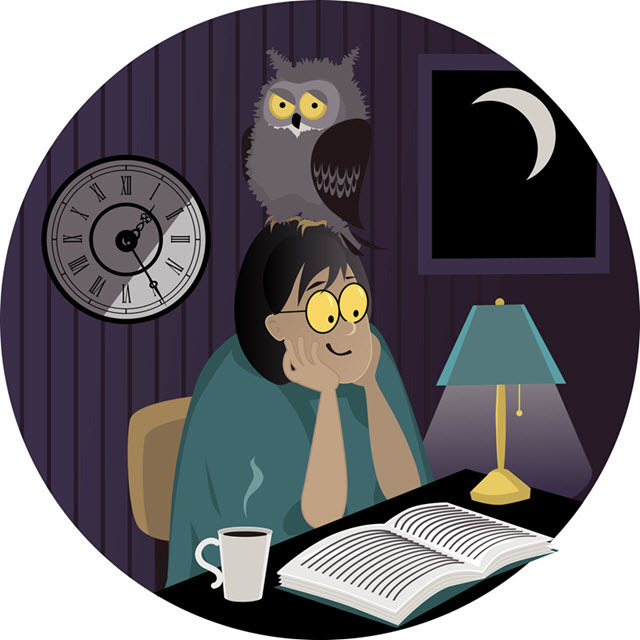 If you work nightshifts or rotate shifts most scientists say that you never become truly accustomed—your biological clock knows you’re supposed to be asleep when you’re actually working. For this reason many people who work night shifts suffer insomnia symptoms, which can be chronic. Others, though, have conditioned themselves to this type of work, and may suffer circadian rhythm disorders because of it. Circadian rhythm disorder is a particular variety of sleep disorders in which the circadian sleep-cycle is upended.